Takeaway: A cross bore can has disastrous consequences. Daylighting is the most sure way to avoid the possibility of a cross bore. It’s nightmare scenario almost worthy of Stephen King: The sewer line was there first. Then, a trenchless operator put in a gas line. The gas line passed right through the sewer line. It wasn’t long before the blocked sewer line drove someone to run an auger through the sewer line, cutting the gas line. What Methods Can Help Avoid Cross Bores? There are many technologies and techniques which can help prevent cross bores, including sondes, radio frequency transmitters and receivers. A sonde can be inserted into existing utility laterals if launched from the main line. It can expose the presence of an unmarked or ill-marked existing underground sewer line. Other tools such as robotic, surface-controlled cameras provide a low-risk method of inspection when launched from the main line. These technologies aren’t foolproof, however, because they may be unable to navigate offset joints or pass through heavy root incursions. A push-rod mounted camera is another method, but still lacks the accuracy of the direct visual inspection. Its limitation lies in the links of the push rod and the inability to move past blockages within a pipe. Induced electric location methods are only usable with metal pipes or utilities that house live electrical conductors, such as electric utilities or communications utilities. Like camera-based inspection, it still lacks the certitude of direct visual inspection. Ground-penetrating radar (GPR) detects subsurface disturbances in the soil. Certain soil types degrade the GPR signal and the GPR unit requires a highly trained operator. The results may be open to interpretation, making the GPR less reliable than direct visual inspection. If direct visual inspection – that is, with the naked eye – is the gold standard for preventing cross bores, daylighting is the means of beginning such inspection. Daylighting is the process of exposing a potential crossing point to daylight, either by mechanical digging with an excavator – such as a backhoe or vacuum truck – or by hand excavation done with a shovel and physical effort. 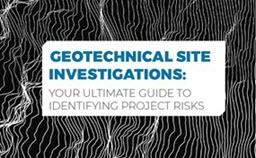 Get a better understanding of the importance of identifying project risks before disaster strikes with proper geotechnical site investigation methods. What Are Cross Bores and How Do They Occur? Cross bores occur when one pipeline or underground utility is in place and a second pipeline or utility’s design cuts across its path – indeed, through its walls – damaging or destroying the integrity of the pipeline or underground utility so crossed. Cross bores can occur when utility location records contain incorrect or inaccurate information. Like Rome, modern cities and their surrounding suburbs are not built in a day. In 1889, the city of Philadelphia, Pennsylvania, was the first city in America have a comprehensive sewage system. The idea gained traction and other cities began to follow suit, but few kept records of the old sewer lines – some of which are still in use. At best, the old records lack accurate information regarding the location of those lines because modern tools, such as global positioning system (GPS) and geographic information systems (GIS) were not available. Even with these modern tools, field notes can be wrong and transcription errors can occur. When transferring those field notes into the GIS maps it should show an accurate location of utilities underground. The U.S. Department of Transportation’s Pipeline and Hazardous Materials Safety Administration (PHMSA) has stated that the cross-bore incidents involving gas pipelines and sewer lines have increased as newly built gas distribution facilities have turned to trenchless technology for the installation of gas pipelines leading from those new facilities. Whatever the cause, cross bore prevention has become an essential part of trenchless technology. This includes using processes like daylighting to expose likely trouble spots before a trenchless project begins. What Should Be Done to Prevent Cross Bores? Today, many cities maintain underground utility records as layers on GIS maps. The geographic information system provides users with a computerized map of an area that is broken down into layers. One or more of these layers is dedicated to underground utilities – sewer lines, gas utility lines, underground electrical utilities, the location of each line, the depth of each line below the surface and other relevant information. This layer (or layers) shows every known utility beneath the city and its suburbs. GIS systems, however – and indeed, even trained GIS technicians and knowledgeable GIS managers – are still beyond the reach of some locales. Some cities still rely on written records 100 or more years old, with all the accuracy that implies. In spite of the promise of technologies such as GIS, however, they are promises that may be based on incomplete or incorrect records. The only sure way to prevent a cross bore is to go to the location and dig a hole in the ground – you expose the potential cross bore to daylight. What Is the Common Ground Alliance? Organizations such as the Common Ground Alliance, with its “dial 811” program, helps trenchless contractors and others find the location of utilities they may encounter if they dig, auger or bore beneath the surface, recommends using every additional means possible to verify the presence or absence of a pipeline before digging, auguring or boring. The Common Ground Alliance is represented in all 50 states and five Canadian provinces. This puts the “dial 811” program’s resources only as far away from the trenchless contractor as the telephone. If there is any question as to whether or not a pipeline is already in place along the path of your planned bore, it is always better to use daylighting to confirm. Spending the time and effort to dig a hole for daylighting is minuscule compared to the time and effort needed to repair the damage caused by a cross bore. A retired merchant seafarer, Will Carpenter sailed the world extensively before settling as far from the sea as possible. Now a technical writer, Will lives in the "hills and hollers" of Tennessee with two formerly feral cats.